June provides the perfect weather for cycling in Pennsylvania. With so many bike-friendly cities like Lancaster and York, bicycling is a great activity for the whole family. This year, cities across the Susquehanna Valley, like Harrisburg, are considering implementing Bike Share programs that will allow more Pennsylvanians access to the joys of cycling. However, with more bicycles entering into the mix of traffic, it is vital that both motorists and cyclists are aware of the PA bicycle laws. Recently, a law was passed in 2014 within the state that affects both motorists and cyclists. The newest PA bicycle law requires motorists to provide a 4-foot buffer zone when passing cyclists on the road. It also prohibits motorists from making a right turn if it would interfere with a cyclist going straight. The driver must wait for the bicycle to pass before completing the turn. The law also requires cyclists to ride as close to the right side of the road as possible. The new law has been considered a win for bicycle advocates and enthusiasts in Pennsylvania. Although it is a difficult law to enforce, it does allow injured cyclists lawful recourse when involved in an accident. That being said, cyclists should still adhere to safety guidelines when riding. According to Pennsylvania state law, bicycles are considered to be vehicles, and are subject to all traffic laws, with few exceptions. This means that bicyclists must stop at red lights and stop signs, and give pedestrians right-of-way. All riders under the age of 12 must wear a helmet. Bikes must be equipped with brakes capable of a complete stop within 15 feet while going 15 mph. At night, cyclists must use a front lamp, as well as reflectors. Cyclists are not allowed on Pennsylvania freeways, unless PennDOT has given special permission. Cyclists must remain as close to the right side of the road as possible. Bicyclists must be sure that they are able to ride with at least one hand on the handlebars. This means, you cannot carry any items that would prevent you from doing so. Always wear a helmet. Helmets can reduce the risk of head injuries by 85 percent. Take advantage of the many bicycle safety and education programs in central PA. Even the safest cyclists and motorists can find themselves involved in a traffic accident. 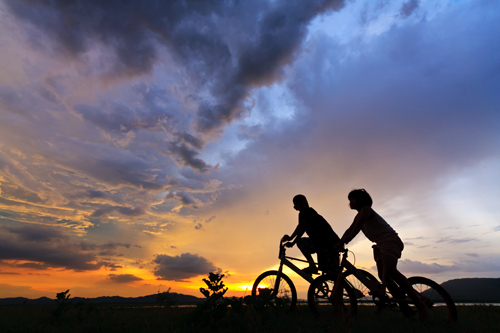 Bicycle accidents can result in serious and life-threatening injuries. If you have been involved in a bicycle accident resulting in injury, depend on our skilled team at Katherman Briggs & Greenberg for help. Contact us 24/7 for Results You Deserve®.